His name is Anzick, named for the family land, above, where his remains were found, and he is 12,500 years old, or more precisely, born between 12,707 and 12,556 years before the present. Unfortunately, my genealogy software is not prepared for a birth year with that many digits. That’s because, until just recently, we had no way to know that we were related to anyone of that age….but now….everything has changed ….thanks to DNA. Actually, Anzick himself is not my direct ancestor. We know that definitively, because Anzick was a child when he died, in present day Montana. Anzick was loved and cherished, because he was smeared with red ochre before he was buried in a cave, where he would be found more than 12,000 years later, in 1968, just beneath a layer of approximately 100 Clovis stone tools, shown below. I’m sure his parents then, just as parents today, stood and cried as the laid their son to rest….never suspecting just how important their son would be some 12,500 years later. From 1968 until 2013, the Anzick family looked after Anzick’s bones, and in 2013, Anzick’s DNA was analyzed. DNA analysis of Anzick provided us with his mitochondrial haplogroup, D4h3a, a known Native American grouping, and his Y haplogroup was Q-L54, another known Native American haplogroup. Haplogroup Q-L54 itself is estimated to be about 16,900 years old, so this finding is certainly within the expected range. I’m not related to Anzick through Y or mitochondrial DNA. Utilizing the admixture tools at GedMatch, we can see that Anzick shows most closely with Native American and Arctic with a bit of east Siberian. This all makes sense. 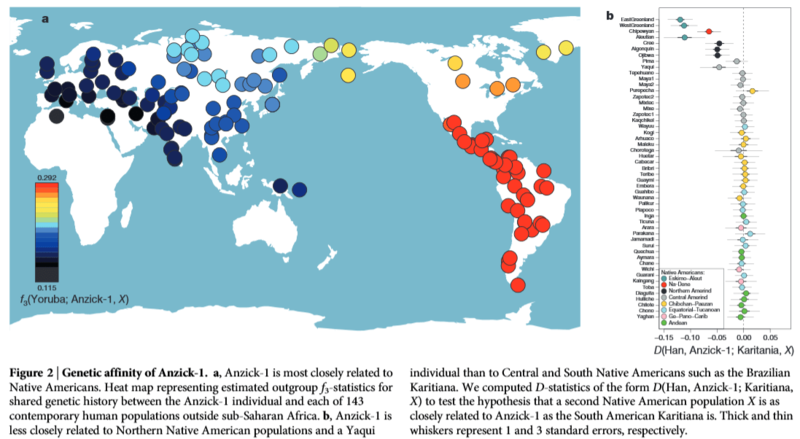 Full genome sequencing was performed on Anzick, and from that data, it was discovered that Anzick was related to Native Americans, closely related to Mexican, Central and South Americans, and not closely related to Europeans or Africans. This was an important discovery, because it in essence disproves the Solutrean hypothesis that Clovis predecessors emigrated from Southwest Europe during the last glacial maximum, about 20,000 years ago. The distribution of these matches was a bit surprising, in that I would have expected the closest matches to be from North America, in particular, near to where Anzick was found, but his closest matches are south of the US border. Although, in all fairness, few people in Native tribes in the US have DNA tested and many are admixed. This match distribution tells us a lot about population migration and distribution of the Native people after they left Asia, crossed Beringia on the land bridge, now submerged, into present day Alaska. This map of Beriginia, from the 2008 paper by Tamm et all, shows the migration of Native people into (and back from) the new world. Anzick’s ancestors crossed Beringia during this time, and over the next several thousand years, found their way to Montana. Some of Anzick’s relatives found their way to Mexico, Central and South America. The two groups may have split when Anzick’s family group headed east instead of south, possibly following the edges of glaciers, while the south-moving group followed the coastline. Recently, from Anzick’s full genome data, another citizen scientist extracted the DNA locations that the testing companies use for autosomal DNA results, created an Anzick file, and uploaded the file to the public autosomal matching site, GedMatch. This allowed everyone to see if they matched Anzick. We expected no, or few, matches, because after all, Anzick was more than 12,000 years old and all of his DNA would have washed out long ago due to the 50% replacement in every generation….right? Wrong!!! What a surprise to discover fairly large segments of DNA matching Anzick in living people, and we’ve spent the past couple of weeks analyzing and discussing just how this has happened and why. In spite of some technical glitches in terms of just how much individual people carry of the same DNA Anzick carried, one thing is for sure, the GedMatch matches confirm, in spades, the findings of the scientists who wrote the recent paper that describes the Anzick burial and excavation, the subsequent DNA processing and results. For people who carry known Native heritage, matches, especially relatively large matches to Anzick, confirm not only their Native heritage, but his too. For people who suspect Native heritage, but can’t yet prove it, an Anzick match provides what amounts to a clue – and it may be a very important clue. In my case, I have proven Native heritage through the Micmac who intermarried with the Acadians in the 1600s in Nova Scotia. Given that Anzick’s people were clearly on a west to east movement, from Beringia to wherever they eventually wound up, one might wonder if the Micmac were descended from or otherwise related to Anzick’s people. Clearly, based on the genetic affinity map, the answer is yes, but not as closely related to Anzick as Mexican, Central and South Americans. After several attempts utilizing various files, thresholds and factors that produced varying levels of matching to Anzick, one thing is clear – there is a match on several chromosomes. Someplace, sometime in the past, Anzick and I shared a common ancestor – and it was likely on this continent, or Beringia, since the current school of thought is that all Native people entered the New World through this avenue. The school of thought is not united in an opinion about whether there was a single migration event, or multiple migrations to the new word. Regardless, the people came from the same base population in far northeast Asia and intermingled after arriving here if they were in the same location with other immigrants. In other words, there probably wasn’t much DNA to pass around. In addition, it’s unlikely that the founding population was a large group – probably just a few people – so in very short order their DNA would be all the same, being passed around and around until they met a new population, which wouldn’t happen until the Europeans arrived on the east side of the continent in the 1400s. The tribes least admixed today are found south of the US border, not in the US. So it makes sense that today the least admixed people would match Anzick the most closely – because they carry the most common DNA, which is still the same DNA that was being passed around and around back then. Many of us with Native ancestors do carry bits and pieces of the same DNA as Anzick. Anzick can’t be our ancestor, but he is certainly our cousin, about 500 generations ago, using a 25 year generation, so roughly our 500th cousin. I had to laugh at someone this week, an adoptee who said, “Great, I can’t find my parents but now I have a 12,500 year old cousin.” Yep, you do! The ironies of life, and of genealogy, never fail to amaze me. Utilizing the most conservative matching routine possible, on a phased kit, meaning one that combines the DNA shared by my mother and myself, and only that DNA, we show the following segment matches with Anzick. Being less conservative produces many more matches, some of which are questionable as to whether they are simply convergence, so I haven’t utilized the less restrictive match thresholds. Of those matches above, the one on chromosomes 17 matches to a known Micmac segment from my Acadian lines and the match on chromosome 2 also matches an Acadian line, but I share so many common ancestors with this person that I can’t tell which family line the DNA comes from. There are also Anzick autosomal matches on my father’s side. My Native ancestry on his side reaches back to colonial America, in either Virginia or North Carolina, or both, and is unproven as to the precise ancestor and/or tribe, so I can’t correlate the Anzick DNA with proven Native DNA on that side. Neither can I associate it with a particular family, as most of the Anzick matches aren’t to areas on my chromosome that I’ve mapped positively to a specific ancestor. Running a special utility at GedMatch that compared Anzick’s X chromosome to mine, I find that we share a startlingly large X segment. Sometimes, the X chromosome is passed for generations intact. Interestingly enough, the segment 100,479,869-103,154,989 matches a segment from my mother exactly, but the large 6cM segment does not match my mother, so I’ve inherited that piece of my X from my father’s line. This tells me immediately that this segment comes from one of the pink or blue lines on the fan chart below that my father inherited from his mother, Ollie Bolton, since men don’t inherit an X chromosome from their father. Utilizing the X pedigree chart reduces the possible lines of inheritance quite a bit, and is very suggestive of some of those unknown wives. It’s rather amazing, if you think about it, that anyone today matches Anzick, or that we can map any of our ancestral DNA that both we and Anzick carry to a specific ancestor. Indeed, we do live in exciting times. On a rainy Saturday in June, 2014, on a sagebrush hillside in Montana, in Native parlance, our “grandfather,” Anzick was reburied, bringing his journey full circle. Sarah Anzick, a molecular biologist, the daughter of the family that owns the land where the bones were found, and who did part of the genetic discovery work on Anzick, returns the box with his bones for reburial. More than 50 people, including scientists, members of the Anzick family and representatives of six Native American tribes, gathered for the nearly two-hour reburial ceremony. Tribe members said prayers, sang songs, played drums and rang bells to honor the ancient child. The bones were placed in the grave and sprinkled with red ocher, just like when his parents buried him some 12,500 years before. Participants at the reburial ceremony filled in the grave with handfuls, then shovelfuls of dirt and covered it with stones. A stick tied with feathers marks Anzick’s final resting place. I wish I could have been there. I would have, had I known. After all, he is part of me, and I of him. Welcome to the family, Anzick, and thank you, thank you oh so much, for your priceless, unparalleled gift!!! If you want to read about the Anzick matching journey of DNA discovery, here are the articles I’ve written in the past two weeks. It has been quite a roller coaster ride, but I’m honored and privileged to be doing this research. And it’s all thanks to an ancient child named Anzick. This entry was posted in Admixture, Ancestor Mapping, Ancient DNA, Anthropology, Autosomal, Biogeographical Analysis (BGA), Chromosome Mapping, Ethnicity, Forensics, GedMatch, History, Inheritance, Migration, Mitochondrial DNA, Native American, Research, Tools, X Chromosome, Y DNA and tagged 52 Weeks of Ancestors, Examples by Roberta Estes. Bookmark the permalink. Hello Roberta in the Clovis Gedmatch , Trish (Loretta Lynn Morrrison) Kit F240238 has her largest CM’s at a Little Over 7. She has also Tried to insert into Mothers of Acadia. they said they can’t get in because no lineage, so she is ungrouped. last note Deb.Estes Any Kin? D4h3a is my maternal Haplogroup from my mom. Our family has been in Arizona for generations. I have not found other members in Arizona who match our family Haplogroup. We were told my great maternal grandmother was either Pima or Yaqui indian from South-central Arizona. Actually how rare is Haplogroup D4h3a in Arizona and where is the largest concentration? Thank you. We don’t know how rare it is in Arizona. Thanks for this article! Very interesting. But I still don’t get why people assumed that there would be no relation to Anzick. Or are we talking about autosomally only? Or is the assumption because not many NA would be tested, and that most of the people would not match because they’re admixed? This was presumed because Anzick’s autosomal DNA was presumed to have “washed out” in the recombination between then and now. And if the population hasn’t been so very small at one point, with very little different DNA, that would have been true. But how does DNA wash out, especially in Anzick’s case? Recombination doesn’t wash a DNA out. And if we’re talking Anzick’s time, we are talking about a group of people who were less mobile, therefore being more alike each other, as in the case of Polynesians who ended up being interrelated many times over. I think the assumption was that it would either have washed out through recombination or become too fragmented to be found today. Same with Neanderthal and Denisovan. And it hasn’t. ah, I got it. Makes sense now. I understand what you mean by fragmented. Very moving……..thank you once again for writing on this topic. The description of the original burial is also fascinating. I absolutely love the revelations we are getting now from ancient DNA. An interesting book to read would be “No Bone Unturned” by Jeff Benedict. We can use this DNA to connect us or disconnect us, but now how, in the future, do we deal with ancient remains. Do we DNA each person or group of person who claims lineage to a set of remains to see who has the closest match, then give them say about what to do with them? Or, do we find anyone who is a match and ask them what they would like to do with the remains? Or do we ask one person or group of person, and depending if we agree with their answer, ask another descendent? Do scientists and researchers now have to worry about every set of ancient remains they find and the court battles that may follow about who is a “closer” descendant? Beautifully written Roberta. It’s truly exciting to know there’s a little bit of Anzick in many of us. And fortunately there are more and more samples being given by Native peoples, which for whatever reason were not included by the paper’s authors in Figure 2, above. I remember the post you did awhile back on the testing done by a group of Canadian first peoples. There was also a paper published a few months ago on the high incidence of Native mtDNA in Cuba. The science keeps on advancing and soon we’ll be able to compare our DNA with hundreds if not thousands of those no longer with us. I have absolutely no NA DNA, there goes some claims of the Indian wife of an early settler, or the female captive bringing back mixed children. At least not in my line, anyway. Sad. I had hoped. Everyone thinks that I have NA ancestry because of my long straight hair. Thanks for all of this great info! Even more interesting is the segment on Chromosome 2 that you attribute to your Acadian ancestry. My dad matches you on that segment. (He is 218960874-220267932, 2.1cM). Sadly, I did not have that segment passed on. But when I compare your mom to my dad at these same levels (min 2 cM, min 200 SNPs) they have a multitude of matching segments. Here is a story about a 7,500 year old Native American burial found recently in San Francisco. I hope the local Ohlone tribe and their list of “most likely descendants” allow DNA testing before reburial. It would be sad not to find out more about who this individual was and how he/she connects to today’s Native American populations. At 7,500 years old, I could be a most likely descendent based on DNA alone. Too bad I am not an official member of the local tribe. Here is another story about the Native Americans swiftly populating the Americas. http://news.nationalgeographic.com/news/2014/10/141023-paleo-indians-migration-pucuncho-basin-andes-south-america-archaeology/? How did you generate the fan chart of your ancestors? Do you have special software? Thank you for writing this article….I was skeptical at first and jumped to my own conclusions before ready all the blog articles you wrote explaining how and why.